When it comes to global change, agriculture cuts both ways. Subject to the vicissitudes of global climate change, population and economic growth, the cultivation of crops and livestock alters atmospheric concentrations of planet-warming greenhouse gases and also contributes to pollution of freshwater and coastal areas. Assessing the risks to and from the agriculture sector—and identifying opportunities for the sector to thrive amid global change—is thus both urgent and essential. 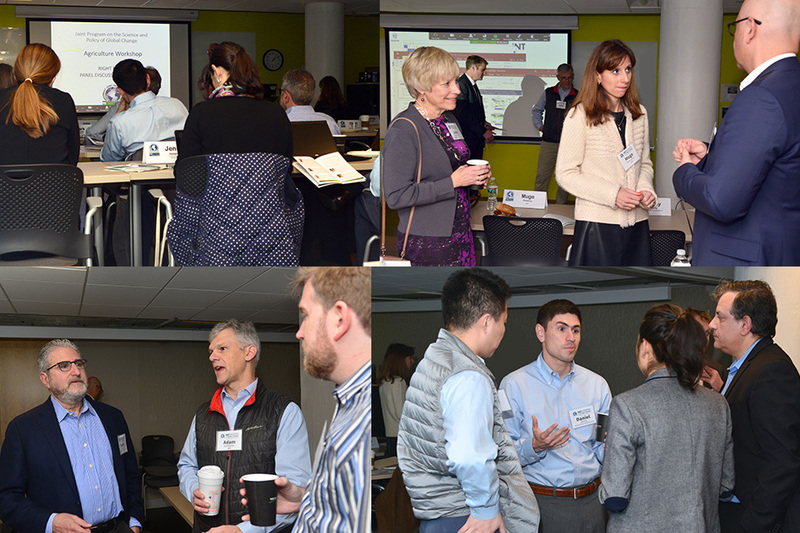 To explore challenges and opportunities for the sector, the MIT Joint Program on the Science and Policy of Global Change convened a one-day workshop, Agriculture & Global Change: Driving Forces, Contributions to Global Change, and Climate Risks, on the MIT Campus on November 1. Drawing about 100 in-person and online registrants from industry, government and academia, the conference was the third of the program’s workshop series, which previously explored water and energy issues. Throughout the day, attendees engaged in detailed discussions with Joint Program agriculture specialists, each of whom delivered one or two-slide presentations on three panels focused on driving forces for agriculture, agriculture as contributor to global change, and climate risks for agriculture. Noting the agriculture sector’s need to work through major structural, value-chain and technology transformations to meet greater demands from population and economic growth, Joint Program Co-Director John Reilly shared projections of demand for/prices of food, livestock and crops from the Joint Program’s 2018 Food, Water, Energy and Climate Outlook. The Outlook shows significant increases in food production driven by population and economic growth as well as transformation of the value chain, with more rapid growth in livestock than crops. Joint Program Research Scientist Kenneth Strzepek showed that how much water a society allocates for agriculture is a reflection of its climate, level of economic development, and evolving value system. Observing that 70 percent of today’s freshwater withdrawals are for irrigation, and that by 2050 about 17 percent of all water now used in agriculture will be at risk from reallocation to non-agricultural economic growth, population and urban growth, and environmental protection. Strzepek highlighted several trends that pose a growing threat to such withdrawals, including the adoption of clean energy generation through hydropower at the expense of water for irrigation. Joint Program Research Scientist Muge Komurcu described a downscaling method she has developed to produce high-resolution regional climate projections that can be used to guide local crop production. Using a regional climate model with detailed land-surface and atmospheric components, she has simulated climate variables including temperature and precipitation at high resolution (less than four kilometers and hourly)—reproducing observed historical climate in, for example, the Northeastern U.S. and Saudi Arabia with a high degree of precision. Joint Program Research Scientist Elodie Blanc presented a simpler, faster way to assess environmental impacts on crop yields. Combining the best of two crop modeling methods—process-based models that simulate a wide range of weather and environmental conditions but are computationally demanding, and statistical models that are based on observed yield data and more efficient but rely on incomplete data sets—Blanc developed statistical emulators that can quickly replicate gridded crop models’ estimates of the impact of climate change on crop yields. “Our goal is to develop a tool accessible to the wider research community seeking quantitative estimates of climate change impacts,” said Blanc, whose emulators enable efficient assessment of several crops at the national or regional level for a range of climatic conditions. Joint Program Deputy Director C. Adam Schlosser explored the extent to which land-use and land-cover change impact the local, regional and global climate by absorbing or redirecting energy received from the sun. He noted that at the regional level, changes in land use and land cover lead to corresponding changes in albedo (reflectivity), soil moisture, canopy and plant characteristics, which can collectively amplify or offset global warming from key atmospheric greenhouse gases. Citing a study he co-authored on the climatic effects of replacing tropical rainforests with crops for biofuels, Schlosser showed that this response can kick in right away, unlike the relatively glacial pace of the global carbon cycle. “A frontier in this research is to gain understanding and confidence of how these [land-use and land-cover] changes impact local precipitation,” he said. “What we need to bring to bear on this issue are more detailed modeling tools, so we can really get at the details behind precipitation and the processes that control it,” he said. Marine Biological Laboratory Research Associate David Kicklighter, a Joint Program collaborator, presented results of a study he co-authored that assessed the effects of two approaches to biofuel production—expanding agricultural land vs. intensifying cultivation on existing agricultural land—on the Earth’s ability to sequester or lose carbon. Joint Program Principal Research Scientist Niven Winchester summarized two studies that he co-authored on the economic and environmental drivers of greenhouse gas emissions. In the first study, he used a global agricultural-economic-energy model to estimate the scope and costs of irrigating more land for 282 global river basins and simulate the impacts of water scarcity. He found that changes in water availability have small impacts on global food, bioenergy and land-use outcomes at the global level (due in part to irrigation and storage responses), but potentially larger impacts at the regional level. “These tools can estimate the impact of a wide range of policies and changes in water availability on food, bioenergy, and land-use outcomes at the regional and global levels, while accounting for basin-level water resource constraints and price-induced changes in irrigation infrastructure,” he said. In the second study, Winchester estimated lifecycle carbon dioxide emissions by economic sector, calculating each sector’s total as the sum of direct emissions (from the use of fossil fuels) and indirect emissions (associated with other inputs used by each sector). He found that indirect CO2 emissions constitute a large share of lifecycle emissions for most sectors, and that, excluding energy-related sectors, the most CO2-intensive sectors in the U.S. include transportation, non-metallic minerals (e.g. cement), non-ferrous metals (e.g. aluminum), and iron and steel. C. Adam Schlosser described a method that he and Joint Program Research Scientist Xiang Gao have developed to project the frequency of extreme weather events such as “100-year” storms and heatwaves—or any event that poses a threat of damage. This information could support decision-makers in the agriculture sector to adapt accordingly. The method identifies observed large-scale patterns in the atmosphere associated with extreme events recorded at a particular location (or field). Applying these associations to a set, or ensemble, of model simulations of future climate can provide a strong consensus in the trends of that extreme event across the ensemble. Angelo Gurgel, an associate professor at the Sao Paulo School of Economics and Joint Program collaborator, evaluated potential climate impacts on global and regional agricultural outcomes between 2015 and 2050. Based on a 2014 IPCC review of climate impacts on crops, Gurgel deduced a set of crop and livestock productivity effects from climate change and simulated those in a new version of the Joint Program’s Economic Projection and Policy Analysis (EPPA) model with detailed agricultural disaggregation. Joint Program Principal Research Scientist Erwan Monier presented a region- and crop-specific assessment of the future climate risks to U.S. agriculture productivity based on a study he led that was aimed at providing agriculture sector stakeholders with the additional information they need to make more informed decisions. In a nutshell, the researchers complement the results of climate/crop model runs with projections of five useful indices of agriculture/climate interaction—dry days, plant heat stress, frost days, growing season length and start of field operations—that clarify what’s driving projected yields up or down. Elodie Blanc presented results from two studies she co-authored examining the impact of climate change on irrigated crop yields in the U.S. and advancing a method to improve crop damage assessment. The first study found that in the U.S. by midcentury, the impact of climate change on irrigation will severely reduce yields for some crops in certain regions, particularly in the Southwest. Under a business-as-usual scenario, climate and socioeconomic changes are expected to reduce the effects of water stress on irrigated yields for maize, soybean, sorghum and wheat, but worsen conditions for cotton and forage. “Some level of adaptation will be feasible, like relocating croplands to regions with sustainable irrigation or switching to less irrigation-intensive crops or more water-efficient irrigation technology,” said Blanc. The second study highlighted a method that can provide faster, easier, more accurate crop damage assessment than currently available tools. Applying simple algorithms to publicly available satellite data of typhoon-inflicted rice damage in the Philippines, the study produced a provincial-level rice-damage index that decision-makers could use to adjust import volumes in response to typhoon damages. “As climate change alters the frequency and intensity of extreme weather events, the new method could empower tropical storm-prone nations to respond more quickly to steep losses of rice and other crops,” said Blanc. Noting the Joint Program’s capabilities to apply global-scale models of climate change and crop yields to regional, local and field-level concerns, participants in the Agriculture workshop identified a number of potential areas for collaboration. These include assessing water risk and sustainable irrigation solutions, further analyzing impacts of climate change on agriculture and how agriculture can mitigate climate change, and developing predictive models for agriculture sector stakeholders that can inform decision-making at the field and business levels. Questions? Please contact John Reilly or Horacio Caperan.